"The blue and white flag, in use (limited) since 1995, incorporates the features of the gonfanon, including the shield with the quartered arms of the province of Trento (1 st and 4 th) and that of Bolzano (2 and 3) . 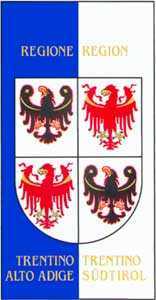 The white and blue are the colors on which they were borne in old coats of arms of Trento and Bolzano respectively. It has never been legally defined, unlike the coat of arms and the banner, approved September 17, 1982 and approved by presidential decree of 21 March 1983." 1. It should be mentioned that the Autonomous Region of Trentino-Alto Adige is nowadays very much void of competences, as most of them have been transferred to the two provinces. 2. Thus, the symbols, including the flag, are in very limited use indeed (as remarked by Roberto Breschi). 3. The flag is not official in contrast to the gonfalone. In the case of Italy, the gonfalone should always be mentioned, as it is usually the only legally defined flag, and often the flags "proper" are derived from it. 4. This is also the case here: the gonfalone is the origin of the flag. 5. I have the impression that the colours of the gonfaloni often do not have a good foundation in history. Gonfaloni have to look nice, with a lot of embroideries, and they have to show the arms, that's all. 6. In the case of TAA it is indeed somewhat mysterious [why the colours blue and white are used]. The sources available to me (from Vexilla Italica) basically say nothing else than Breschi (as cited above): when exactly the arms were borne on white or blue, respectively, and in which context (flag? gonfalone? ), is not mentioned. The original source for the sentence is the 1984 article (see below). - V.I. 1984 (2): p. 33-37. - V.I. 1996 (19): p. 11-16. 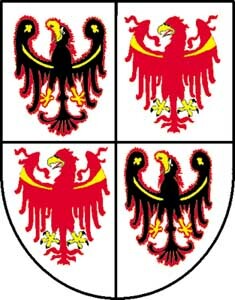 The coat of arms in the flag is a combination of the arms of the two provinces, Trento and Bolzano, but the flags of those provinces are white-red and burgundy-white, respectively.